SAALT is profoundly disappointed that today’s Supreme Court 4-4 split in U.S. v. Texas failed to reach a decision on the Deferred Action for Parental Accountability (DAPA) and expanded Deferred Action for Childhood Arrivals (DACA) programs, part of the President’s executive action on immigration issued in November 2014. The original DACA program announced in 2012 remains, and the Supreme Court ruling upheld a lower court ruling blocking the DAPA and expanded DACA programs. The prolonged and unnecessary legal challenge to these common-sense immigration programs comes at the expense of millions of immigrant youth and their families. As a result of today’s ruling, millions of immigrants, including 450,000 undocumented Indian Americans alone, cannot contribute to the economy and pursue their dreams. The only real solution is legislative change through Comprehensive Immigration Reform. Today, over four years since the implementation of the original DACA program, more than 728,000 out of an estimated 1.16 million eligible people have received DACA, allowing them to pursue higher education and employment without constant fear of deportation. Nearly 225,000 Indian and Pakistani individuals are eligible for DACA and DAPA. India ranks among the top ten origin countries with individuals eligible for DACA, and ranks third among individuals eligible for DAPA. At least 23,000 Indian and Pakistani youth are eligible for DACA and expanded DACA. At least 200,000 Indian and Pakistani individuals are eligible for DAPA. In April, SAALT stood with allies across the country at the Supreme Court during the oral arguments on this case to express our hopes for a ruling that would support the dreams of millions of immigrant families nationwide. 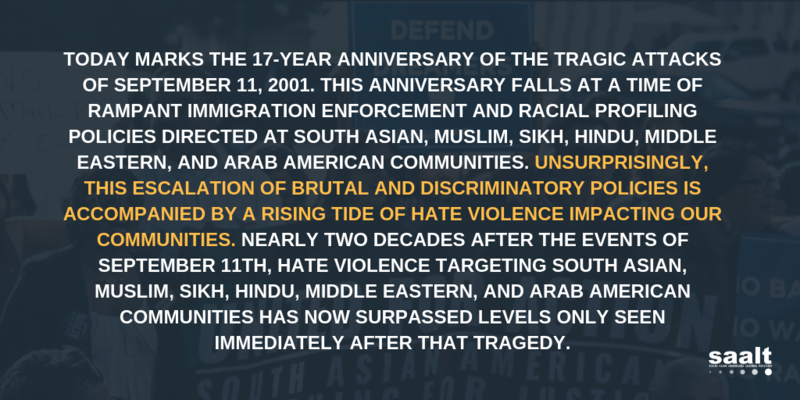 That same day we released a video series featuring South Asians impacted by our broken immigration system illustrating just how much our community has at stake in ensuring DAPA and expanded DACA move forward. “Executive action on the part of the President was necessary to move past a gridlocked Congress that refused to pass common-sense immigration reform legislation. Without this, millions of immigrants will not be eligible for the full benefits they deserve, like healthcare. Congress needs to do its job. Polls continue to show that a bipartisan majority of Americans support a roadmap to citizenship for undocumented immigrants. Today’s ruling is a catalyst for the next Congress to act and ensure that all immigrants have a path to the full benefits of citizenship and allow us to live up to our core values of fairness and opportunity,” said Suman Raghunathan, SAALT’s executive director. In the meantime, we encourage individuals to continue applying for the existing DACA program, which was never under legal scrutiny, and should be fully utilized by those eligible. There are several actions the President can still take to provide relief for immigrants. Black Alliance for Just Immigration named five, including ending collaboration programs between ICE and local law enforcement. The case will return to the lower courts and we join our friends at National Immigration Law Center in urging the Department of Justice to seek a rehearing at the Supreme Court when a ninth justice, who should have already been in place, is finally confirmed. South Asian Americans Leading Together (SAALT) joins the nation in mourning the victims of the deadly shooting in Orlando’s Pulse gay nightclub. During the month of Ramadan and a month dedicated to uplifting and celebrating the Lesbian, Gay, Bisexual, Transgender, Queer, Intersex, Asexual (LGBTQIA) community, it is especially heartbreaking to mark the deadliest mass shooting in our nation’s history. We join our partners and allies, including the Muslim Alliance for Sexual and Gender Diversity (MASGD), the National Queer Asian Pacific Islander Alliance (NQAPIA), and SALGA-NYC in standing against the criminalization of entire communities in the face of this tragedy. We take this time to honor our partnership with LGBTQIA communities to take on hate violence and domestic terrorism directed at our communities. We will continue to stand shoulder to shoulder to speak out, demand policy change, expect law enforcement to protect our communities, and lift up each other’s humanity. We cannot allow tragedy to divide our communities when solidarity is more important than ever. And, for everyone who stands at the intersection of Muslim and LGBTQIA identities, we offer you extra love and support. We see you and we stand with you. LGBTQIA communities have been uniquely targeted for hate violence. Sexual orientation is the second highest bias motivating hate crimes, according to the latest FBI statistics. The media and politicians have already begun characterizing the Orlando shooter as a “terrorist” in the absence of any facts. The collective racist, Islamophobic, and homophobic rhetoric and sentiment from our leaders, gone largely unchecked, have created an environment that rationalizes backlash and it cannot continue. We will continue to fight against policies that justify profiling and surveillance of our communities that ultimately make us all unsafe. Please utilize this list of LGBT Muslims who can speak to media.